today is the birthday of the musical and cultural icon woody guthrie. I have posted many songs of woody's on the mouse in the past so I thought perhaps I'd like to continue my current trend of introducing some perhaps lesser known musicians that rock the world! today's song is from another musician whose birthday is today - angelique kidjo. if you don't know the music of angelique I hope I have helped remedy that! her voice is transcendent and the movement of her songs - whether it is a lullaby or an afropop dance tune well I find all of her songs simply quite irresistible! the song I chose for today is entitled niama - I don't know what the words mean, but I know I like it. I first encountered this the tune on putumayo's album of lullabies called dreamland. by the way, accompanying angelique on this tune is carlos santana (another musician with a july birthday - july 20th to be exact!). longtime readers of the mouse may recall that I am preoccupied with birthdays a little more than usual during the month of july! 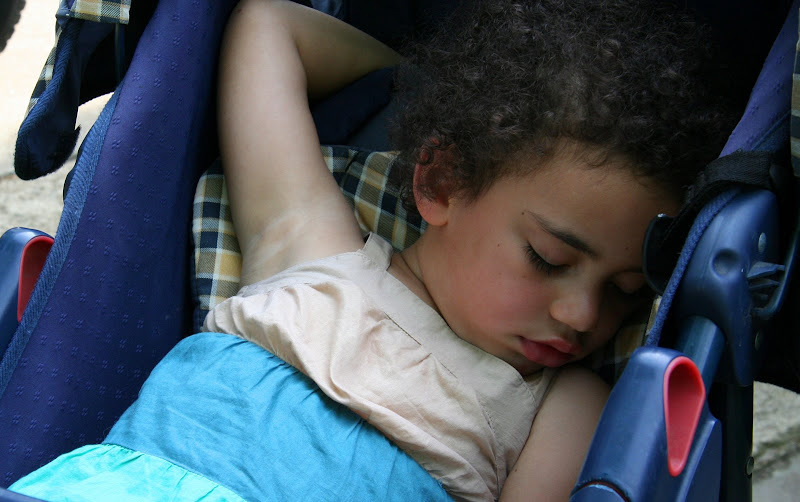 photo: ms t taking a stroller siesta - on july 26 ms t will be turning 4!! by the way, I'm not the only one preoccupied with birthdays this month!! kimy, how adorable is this pic? Got one of Princess Cheese( I think she was 5, at the time ). Hey! Ms T's b-day is only four days after Mom's. Early Happy Birthday! Angélique Kidjo is big over here - the song goes well with Ms T snoozing away. Lovely photo , Happy Birthday to Ms. T. We will be seeing party pics, yes? I love this sleeping beauty. Four yers old and her entire life ahead. Sounds great. A beautiful voice, to go with the beautiful child. How much better would we be if we were not told how bad we are? She's so cute!In a blink of an eye my son will be 2!They are growing so fast i know! Love a sleeping baby . .she's cute as a button and Angelique Kudjo just doesn't age, how does she do it?